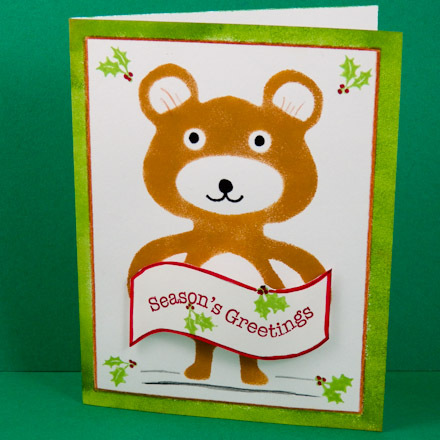 Make a batch of Christmas cards in a flash, featuring a stenciled Christmas bear holding a 3-D banner. 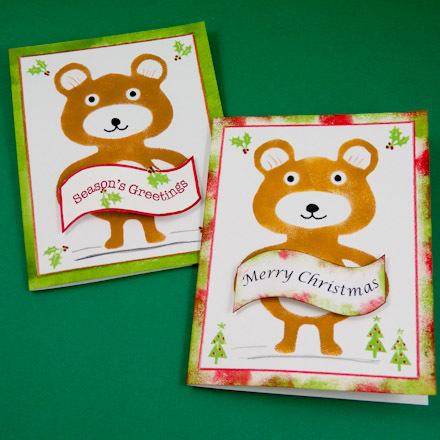 Select from two stencil templates on the included printable pattern to cut a stencil that you'll use with acrylic paints to create cards for sending to friends and relatives. 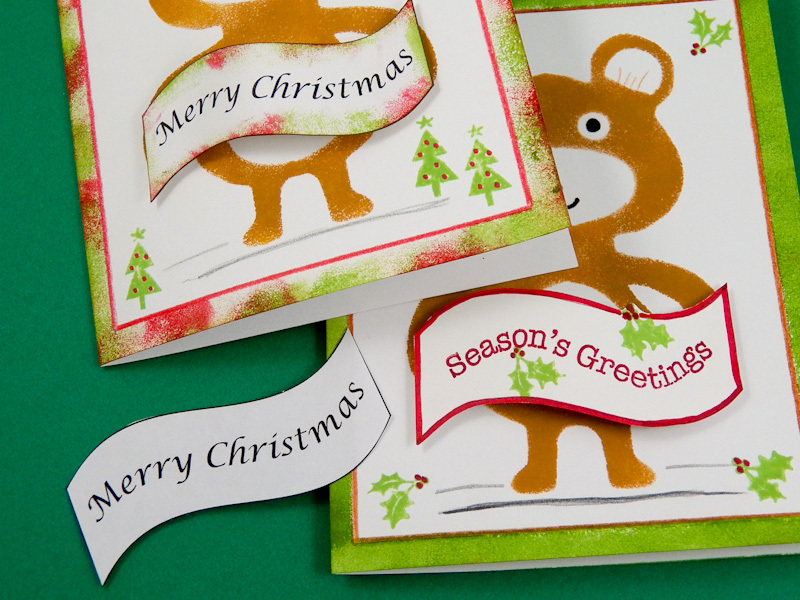 If you have never stenciled before, that's no problem—just follow the easy steps in the Stenciled Cards tutorial from Aunt Annie's Greeting Card Class. If you are new to card-making, review these tutorials for ideas and basic techniques. Download and print the stencil pattern on white paper or cardstock. 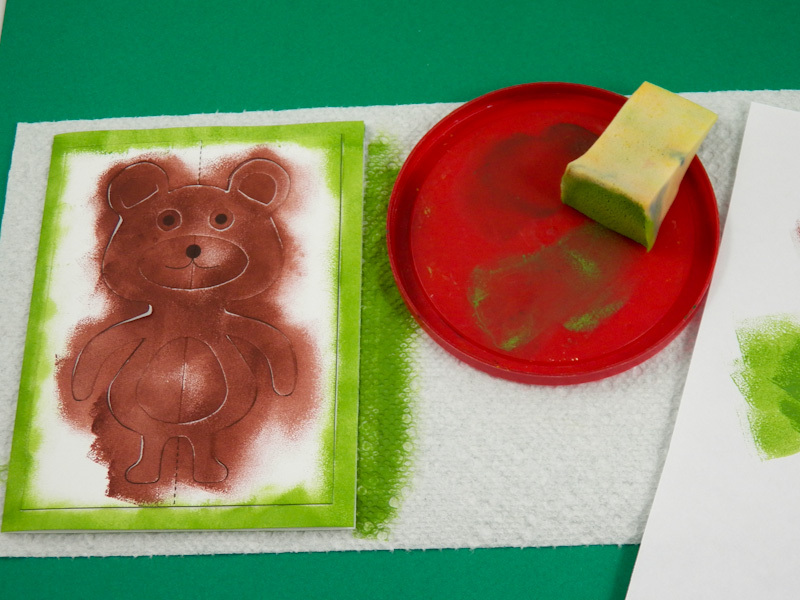 Tip: Computer paper works fine for stencils, but may wrinkle when wet and can only be used a few times. 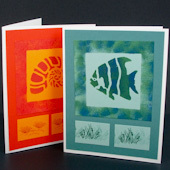 Cardstock stencils are a bit more durable; however, special stencil paper or film is available at craft and graphic arts stores. It cuts easily, doesn't tear, and lasts almost forever. 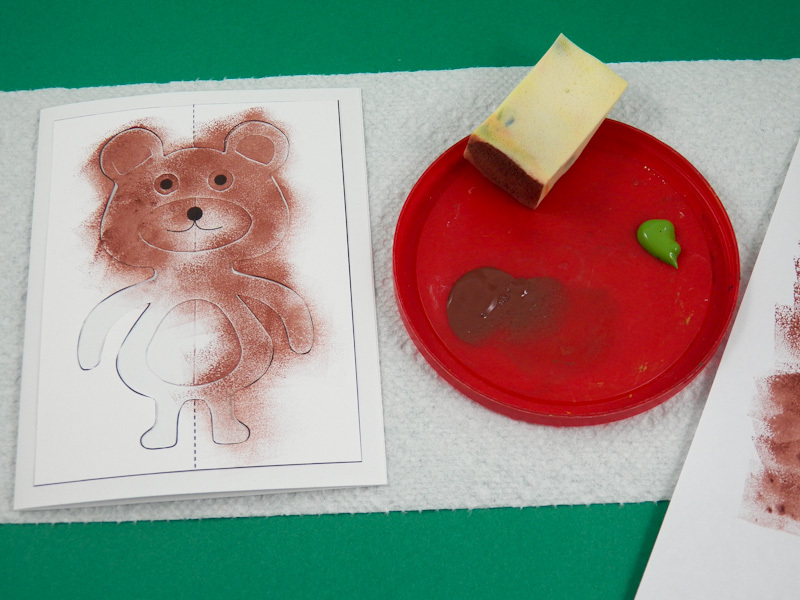 When using stencil paper or film, trace the pattern onto it. Or, place the printed pattern behind the stencil paper or film, and cut on a cutting mat or thick piece of cardboard using a craft knife. Cut out the rectangle around the stencil template you selected. Be sure to make the cuts straight and the corners square. Fold the rectangle in half on the dashed line. Be sure that the printed stencil design is on the outside. Cut the stencil on the bear outline. Remember: you are cutting away the center. Be careful not to cut through the frame of the stencil. Carefully unfold the paper and flatten the crease with your fingers. 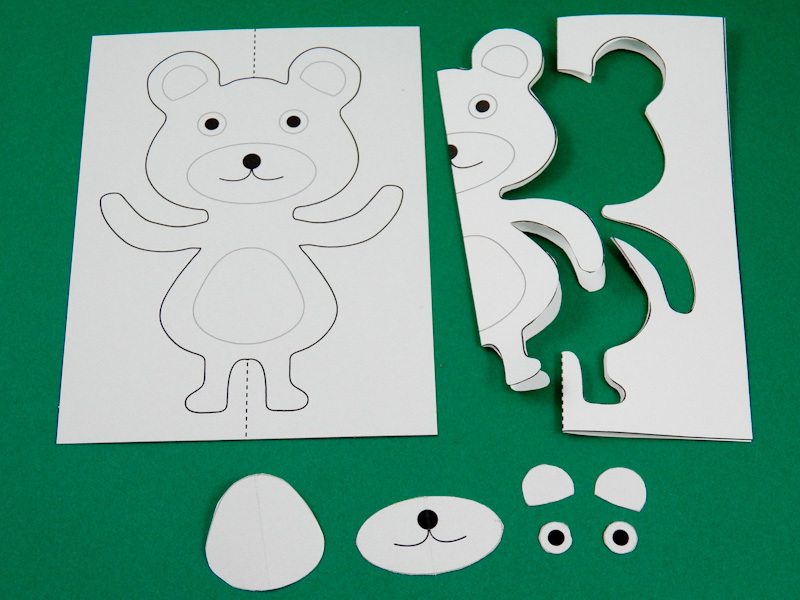 Cut out the tummy, muzzle, eyes, and ear insides from the bear cutout. These pieces are part of the stencil and are used to mask (leave white) those areas of the bear. Make some rolls of drafting tape or masking tape and apply them to the back of the main stencil and the stencil parts. You can also use repositionable spray adhesive or glue. Center the main stencil image on the card front and press to secure it. Place the other stencil parts in the center of the main stencil and press to ensure a good hold. Put a few drops of paint on the plastic lid and load a dampened sponge with paint; brown works well. Dab up and down on the stencil until you achieve the desired darkness and shading. 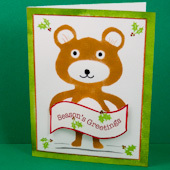 See the Stenciled Cards tutorial for more detailed instructions and stenciling tips. Apply paint around the outside edges of the stencil to create a border on the card. Use any colors you like; red and green are nice. Carefully remove the stencil and all the stencil pieces by lifting straight up. Repeat the process for additional cards. 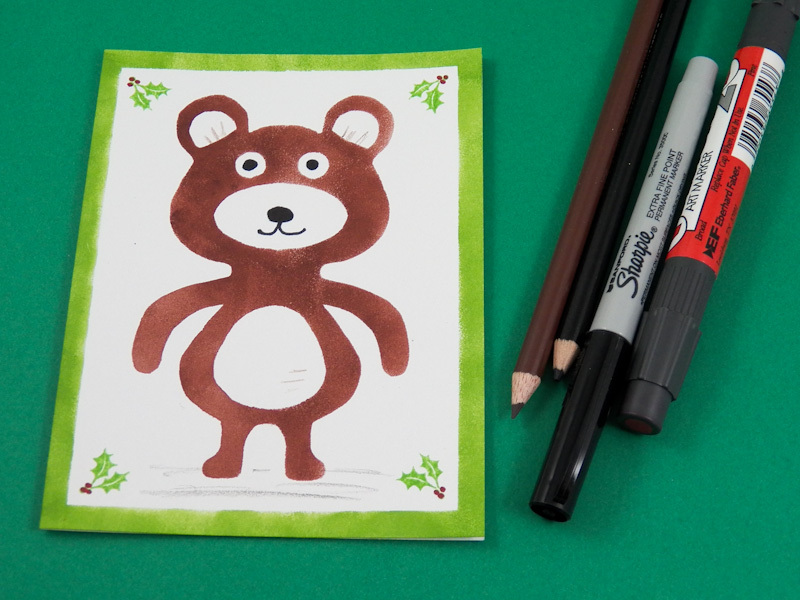 Use a black marker to draw eyes, nose, and mouth on the bear. Use colored pencils to add more details, like a few tufts of fur in the ears or some green holly leaves with red berries. 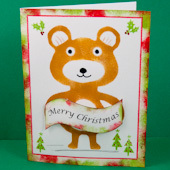 You can also use small Christmas-themed rubber stamps to decorate around your Christmas bear. 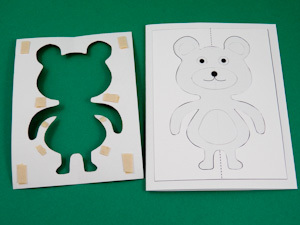 Cut out the banner that goes with the bear stencil you selected. 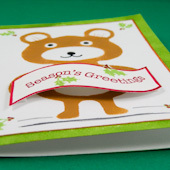 Use the banner as is, or trace the shape onto white cardstock and write or stamp a greeting. You might also dab the banner with paint or decorate it with rubber stamps or markers. Use glue or double-sided foam tape to attach the banner to the bear's hands. 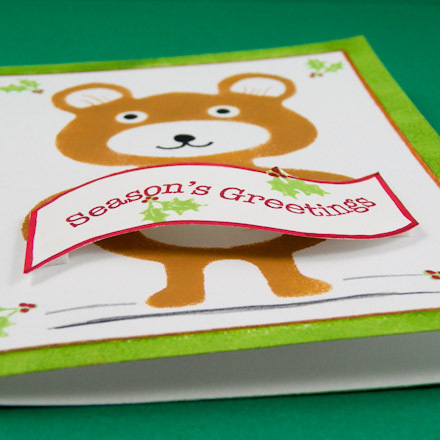 For a 3-dimensional effect, make a slight bow in the banner when attaching it to the card. First, attach the banner to one hand, then flex the banner just a little before attaching the other end. This is easier with double-sided tape. That's it! 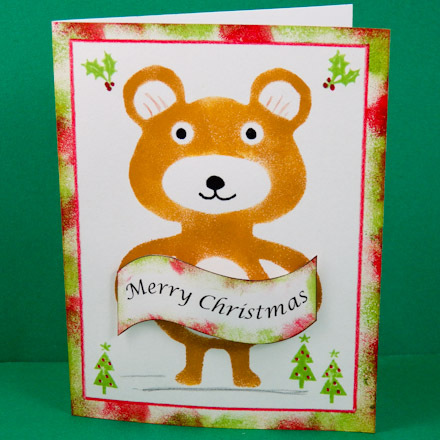 Your stenciled Christmas card is done! 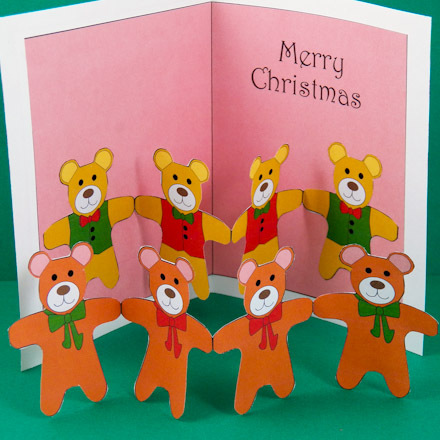 Tip: Use the Christmas Bears and Bow-ties ePaper to make Boxes and Bags or to wrap gifts that coordinate with the Stenciled Bear Christmas Cards. For more Christmas ePapers to download, see Christmas Dots ePapers, Christmas Stripe ePapers, and Christmas Dots Paper Ribbon ePaper. Tip: Make borders on the card and banner in green and red. Use a red colored pencil to outline the card's border. 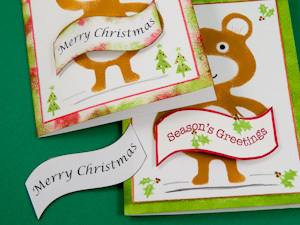 Tip: Sponge the card's border in red and green and add a few highlights to the banner. 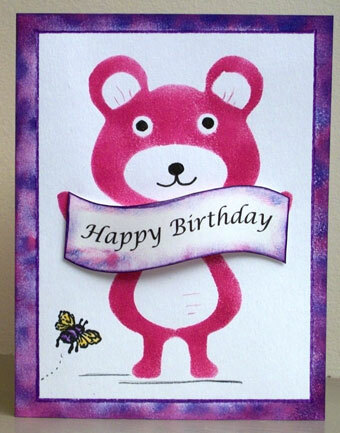 Tip: Attach the banner to the card with double-sided tape and give it a slight bow. 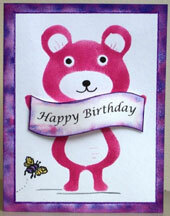 Tip: Add a teddy bear pop-up to your stenciled bear card. 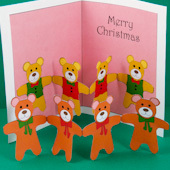 See how in the Christmas Pop-Up Cards craft project. 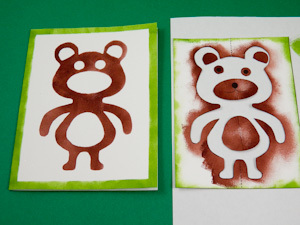 Related craft: See the Stenciled Cards tutorial for techniques and ideas for making cards using stencils.